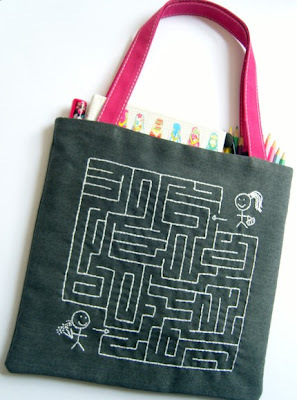 Boy- I really like this embroidered maze bag by drummbellina on etsy. It's so simple and yet, so complex! Like, oh I dunno...love? (It also makes me think of sashiko.) A maze! Why didn't I think of that? Why didn't you think of that? Thank goodness she thought of it! This is really cute! What a lovely idea. And hey, I thought of sashiko when I first saw this too! Maybe because of the geometric design of white on a dark colour. Tho it may also be because I've got a book on sashiko from the library at the moment, Japanese Sashiko Inspirations by Susan Briscoe, it's a really lovely book with big and small "taster" projects to try out the techniques. That's a-mazing! lol funny I'm planning on putting some mazes on pj tops for Christmas presents, I really like that Japanese embroidery that i can't spell and thought it would look quite manly. Now I've seen it on the bag, I'm sold... off maze hunting now! This is so neat, what a creative idea!